The Season 6 premiere of Game of Thrones is just two days away, with new episode The Red Woman airing Sunday, April 24 at 9 PM ET on HBO. Google Play is getting in the Westeros spirit with new interviews in an exclusive series that begins rolling out today. The site is also debuting a trivia game with the cast in celebration of the HBO NOW app on Google Play and the online store's Game of Thrones promotions that will help fans prepare for the next Iron Throne battle as the highly anticipated Season 6 premiere gets underway. In these new exclusive featurettes on Google Play, the actors who play some of the most loved and hated characters on the show share their experiences in the Seven Kingdoms as they dish about their favorite season, discuss best and worst character traits, memorable storylines, play trivia games and more. 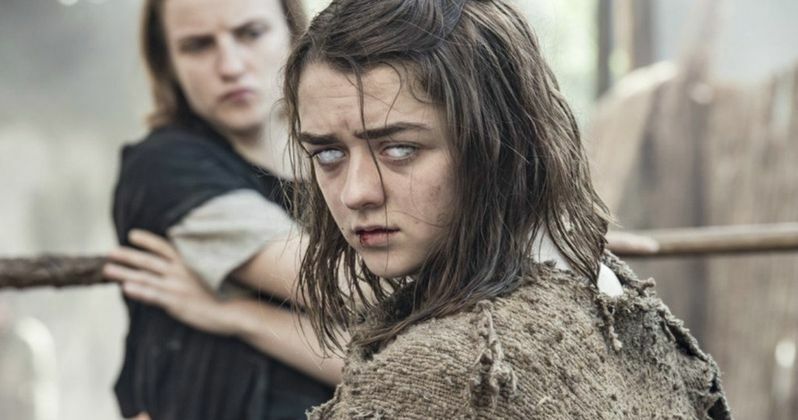 In "Character Strengths," Maisie Williams reveals that her favorite strength of character in Arya Stark is her determination, while her on-screen brother Isaac Hempstead Wright favors Bran Stark's ability to stay strong and never give up despite his disability and challenging journey away from Winterfell. And what about evil Melisandre? According to Carice van Houten, it's her "consistency" ....to destroy anything her in her wake! They're going to need all these strengths and more as new threats emerge this season! The trivia video features stars such as Alfie Allen (Theon), Michael McElhatton (Roose), Jonathan Pryce (High Sparrow), Iwan Rheon (Ramsay), and more asking trivia questions, with fans encouraged to keep score and share their results on social media. After each question is asked, the scene featuring the corresponding answer is shown. If you still haven't watched this popular drama series at all, Google Play is giving fans a chance to get caught up, by offering the first ever episode for free. The pilot episode will be avaialble at Google Play between now and April 28. But this offer is only open to U.S. and Canada residents. The series is coming off its most secretive off-season yet, with the network stopping its tradition of revealing new characters and cast members during its annual Comic Con panel. While there have been various reports over the past few months about the new cast members and the characters they're playing, nothing has been confirmed by the network. HBO even stopped sending advance screeners to members of the press, after the first four episodes leaked online just one day before the Season 5 premiere last year. Season 6 will also mark the first time that the show has caught up with the novels written by George R.R. Martin, who has yet to publish his long-awaited sixth and seventh books in his A Song of Ice and Fire novel series. Still, the veil of secrecy swirling around this show is about to be lifted when the Season 6 premiere debuts Sunday, April 24 at 9 PM ET on HBO. While we wait for this long-awaited premiere, check out these new videos below to get ready for all of the action coming to Westeros this season.